Scottdale is a census-designated place (CDP) in DeKalb County, Georgia, United States. The population was 10,631 at the 2010 census. Scottdale, aka SCD is located at 33°47′40″N 84°15′44″W﻿ / ﻿33.79444°N 84.26222°W﻿ / 33.79444; -84.26222 (33.794337, -84.262110). The unincorporated community is centered on East Ponce de Leon Avenue, between Decatur and Clarkston. 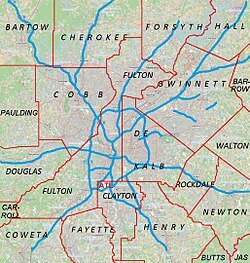 The northern boundary is Stone Mountain Freeway; the eastern boundary is Interstate 285; the western boundary is roughly DeKalb Industrial Blvd. ; and the southern boundary is roughly the city limits of Avondale Estates. The ZIP code for Scottdale is 30079. According to the United States Census Bureau, the CDP has a total area of 3.5 square miles (9.1 km2), all land. According to the 2010 census, there were 10,631 people residing in the CDP. The racial makeup of the CDP was 29.9% White, 37.7% African American, 0.20% Native American, 23.0% Asian, 0.01% Pacific Islander, 2.3% from other races, and 3.8% from two or more races. Hispanic or Latino of any race were 5.3% of the population. 12.7% of the population are Asian Indians. As of the census of 2000, there were 9,803 people, 4,010 households, and 2,201 families residing in the CDP. The population density was 2,818.2 people per square mile (1,087.6/km²). There were 4,236 housing units at an average density of 1,217.8/sq mi (470.0/km²). The racial makeup of Scottdale was 48.6% Black, 37.1% White, 0.19% Native American, 9.60% Asian, 0.18% Pacific Islander, 1.7% from other races, and 2.65% from two or more races. Hispanic or Latino of any race were 4.5% of the population. There were 4,010 households out of which 67.3% had children under the age of 18 living with them, 29.8% were married couples living together, 69.1% had a female householder with no husband present, and 45.1% were non-families. 18.5% of all households were made up of individuals and 5.5% had someone living alone who was 65 years of age or older. The average household size was 2.44 and the average family size was 3.15. In the CDP, the population was spread out with 34.5% under the age of 18, 12.0% from 18 to 24, 39.3% from 25 to 44, 16.7% from 45 to 64, and 7.5% who were 65 years of age or older. The median age was 31 years. For every 100 females, there were 90.9 males. For every 100 females age 18 and over, there were 64.4 males. The median income for a household in the CDP was $18,731, and the median income for a family was $27,521. Males had a median income of $27,489 versus $21,813 for females. The per capita income for the CDP was $24,262. About 54.24% of families and 76.4% of the population were below the poverty line, including 44.6% of those under age 18 and 32.3% of those age 65 or over. Scottdale is named for Colonel George Washington Scott, who founded the Scottdale Cotton Mill in the late 1800s. Colonel Scott arrived in DeKalb County from Florida, where he had previously owned a plantation, served in the Confederate Army, and unsuccessfully run for governor. Col. Scott was also a benefactor of nearby Agnes Scott College. The Scottdale Cotton Mill development included the mill and nearby housing for workers. From the 1920s through the 1940s, Scottdale Manufacturing Company even supported a baseball team. The mill shut down in 1982, but many workers found jobs elsewhere in metro Atlanta. Philanthropist Tobie Grant donated several acres of property to disenfranchised, unemployed African-Americans and created a community known as Tobie Grant. This community still houses low-income African Americans to this day. Oak Forest Apartments was also opened under this theme in 1968. The commercial district in Scottdale is focused on East Ponce de Leon Avenue, which bisects the community from the southwest to the northeast. Your DeKalb Farmers Market and antique shops are located on this road, along with several auto body shops and industrial buildings. Steel LLC maintains a large steel fabrication and distribution facility in Scottdale, near the intersection of North Clarendon Avenue and East Ponce de Leon Avenue. Efforts to rehabilitate East Ponce de Leon Avenue commenced in 2007. Scottdale, Georgia has produced musical, sports and entertainment talent such as the rappers Mr. Ku, Joe Green, Charlie Boy Gang, Brothers 3 Band with Michael Harden, A-Dam-Shame, as well as recent retiree from NFL New England Patriots Patrick Pass (a Super Bowl winner),comedian Saleem Cooke. Avondale Middle School, 3131 Old Rockbridge Rd. Robert Shaw Theme Elementary School, 385 Glendale Rd. DeKalb County Elementary School. Avondale High School 1192 Clarendon Road, closed 2011 to public turned into a Performance Arts only campus. Druid Hills High School, Decatur, Ga.
Cedar Park, 3165 Cedar St. Three acre DeKalb County park with a multi-use field, basketball court, multi-use court, playground and picnic area. Hamilton Recreation Center & Park, 3262 Chapel St. Eight acre DeKalb County park with a softball field, football field, a multi-use field, recreation center and playground. Needham Park, McLendon Dr. & East Ponce de Leon Ave. Greenspace park. ^ "Race, Hispanic or Latino, Age, and Housing Occupancy: 2010 Census Redistricting Data (Public Law 94-171) Summary File (QT-PL), Scottdale CDP, Georgia". U.S. Census Bureau, American FactFinder 2. Retrieved October 28, 2011. ^ "Scottish Place Names - Atlanta, Georgia, USA". www.rampantscotland.com. ^ "Atlanta Steel Suppliers - Structural Steel Fabrication Companies - Steel, LLC". This page was last edited on 1 December 2018, at 19:47 (UTC).